BC Parks, the Boundary Invasive Species Society and Boundary Habitat Stewards are doing restoration planting tomorrow (Wednesday) at Boothman’s Oxbow Provincial Park. Come at 11 a.m. or 1 p.m. for fun, informative exercise just 5 minutes from Grand Forks! https://goo.gl/3zrfBR. More planting at Christina Lake on Thursday with the Christina Lake Stewardship Society – Meet at the Welcome Centre at 10:00 a.m. Learn about riparian plants, invasive species, and habitats and species at risk while working alongside some of our dedicated watershed stewards! Efforts to protect fish habitat and protect graves at the Sion Cemetery are well underway, thanks to the efforts of course participants and volunteers during a recent course on Soil Bioengineering. Everyone who watches the Kettle River has seen it change its course over time. But when Pat Horkoff saw rapidly advancing erosion threaten graves at the Sion Cemetery west of Grand Forks, he called together local groups to find and implement solutions. Since 2011, Horkoff, Chair of the Sion Cemetery Society, has noticed a disturbing trend on the slope below the site. The north bank of the Kettle River had started slipping into the river at an alarming rate. Not only graves were at risk: sediment from the eroding slope threatened to choke the valuable fish habitat in the side-channel just downstream. 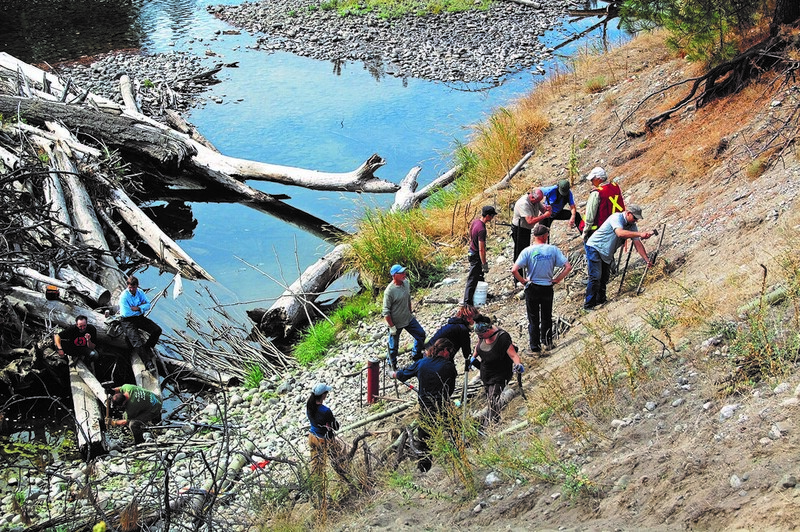 The problem stemmed from a log jam that shifted, directing a portion of the current against the slope and undercutting the unstable sand and gravel. Horkoff approached me, Jenny Coleshill of the Granby Wilderness Society and Regional District Director Roly Russell to ask for help. What could we do to protect the Cemetery and the side channel? Over the last year, we developed a plan to protect fish habitat and graves at the same time using a ‘soil bioengineering’ approach with native plants. We knew the steep, unstable slope made it a very difficult site for a typical engineering solution such as ‘rip-rap’ (angular boulders placed on the base of the slope). Furthermore, having machinery cross the river would be too risky and costly. Instead, we investigated using woody plants such as cottonwood, willows, and red-osier dogwood to stabilize the slope. The practice is known as ‘soil bioengineering’ (not to be confused with genetic engineering and genetically modified organisms, or GMO). These plants are special. First, they adapted to life on riverbanks and gravel bars by tolerating ‘wet feet’ – roots and stems that can be submerged for part of the growing season. They grow roots rapidly in search of nutrients and moisture, up to 1 cm per day, quickly creating a root mass that can protect the banks from further erosion much better than the fine, shallow roots of grasses. Most importantly, if the timing is right their stems can root almost anywhere along the length, even when there is no roots. In natural floodplain environments, this allows pieces of stem broken off by floods, storms or landslides to rapidly root and colonize new environments. Bioengineering practitioners use this to their advantage by deeply planting dormant, live cuttings directly in the ground. When combined with other structural features such as large rocks and anchored logs, bioengineering can provide a cost-effective and beautiful solution to slope stabilization and streambank protection problems that benefits fish and wildlife habitat better than traditional engineering solutions. To build our skills and get the project going, we invited bioengineering expert David Polster to teach a course at Selkirk College (held September 17 and 18). Thirteen students from across the region and beyond learned the theory and practice of soil bioengineering and had a full day of hands-on experience installing the design at the Sion slope. We continue to work with volunteers and a local silviculture crew to complete the project in the coming weeks. This project has been made possible by a number of dedicated volunteers from across the community, the participants in the course, and by the generous financial contributions of RDKB Director Roly Russell, the Sion Cemetery Society and the Lapsha Ladies at the USCC. Please contact me if you would like to be involved.